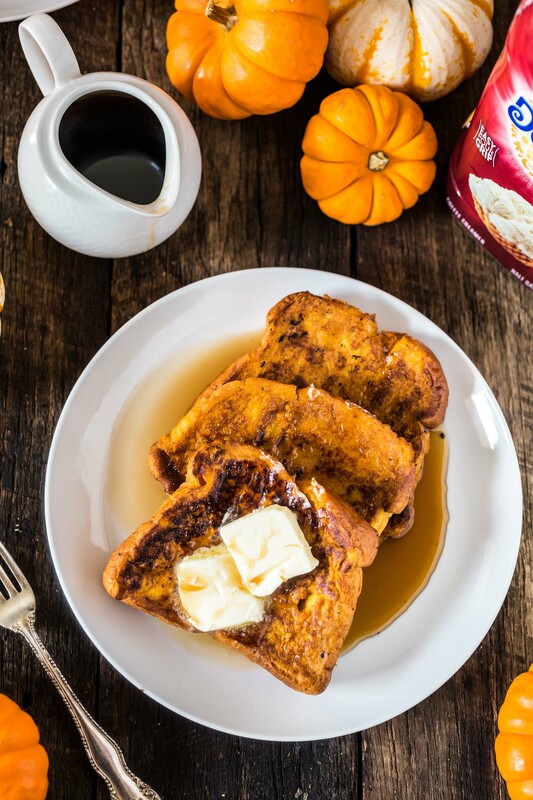 This Pumpkin French Toast is the perfect Fall breakfast! Easy, delicious and coated in everybody’s favorite autumnal ingredient: pumpkin, of course. ??? Guys, I can’t believe it’s finally Fall! The supermarkets here are full of those beautiful fall mum flowers that are just starting to blossom, Halloween candy, apples and pumpkin galore. And everything smells of cinnamon! Yep, you couldn’t miss the start of this season even if you tried! 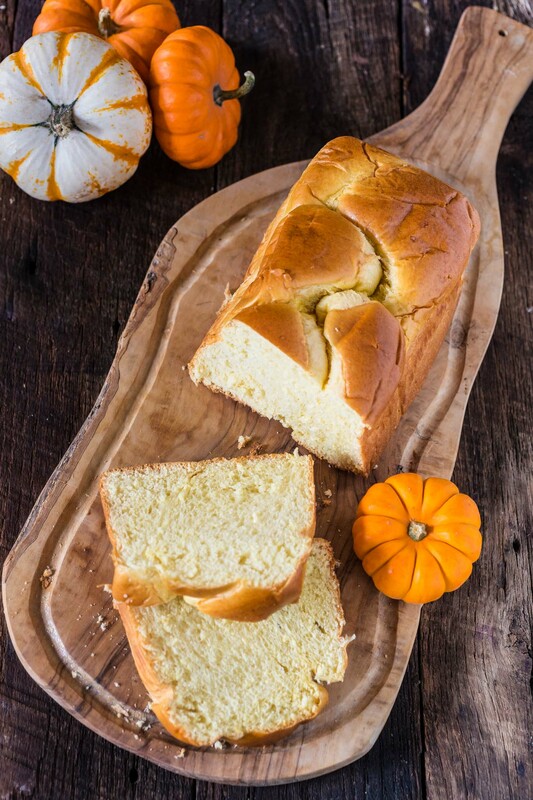 Bloggers around the web have been sharing pumpkin recipes since mid summer, but you guys know me, right? I am always late to the party! Besides, I was too busy eating all the tomatoes, berries and peaches that summer has to offer. BUT, to make it up to my tardiness, I decided to kick off pumpkin season with a very decadent breakfast dish: Pumpkin French Toast. The truth is I don’t make french toast often, so when I do, it has to be extra special. The type of breakfast that caresses your soul and gets you all fuzzy and cozy inside! I usually reserve scrumptious breakfasts like that to weekends. Mostly because I get to enjoy them with my husband, possibly while still snuggling in bed, sipping a latte and making fun plans for the day. And speaking of indulgence, I need to confess that I was naughty. Very naughty! 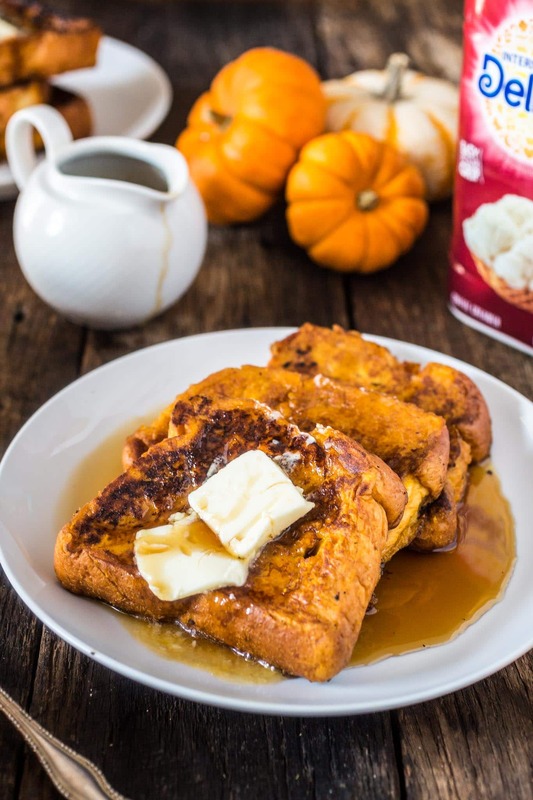 The secret – not so secret anymore – ingredient in this pumpkin french toast is International Delight® Cold Stone Creamery™ Sweet Cream! ??? Oh you guys, you won’t believe how much better french toast is when you use cream instead of milk. And better yet if you use the Cold Stone Creamery™ Sweet Cream flavor! There are seriously no words to describe it. And the funny thing is that this idea came out of a mistake. My husband’s mistake! As in he did the mistake of drinking all the milk and not leaving me any. So when I got all the ingredients ready to make french toast, I opened the fridge and… there was no milk! 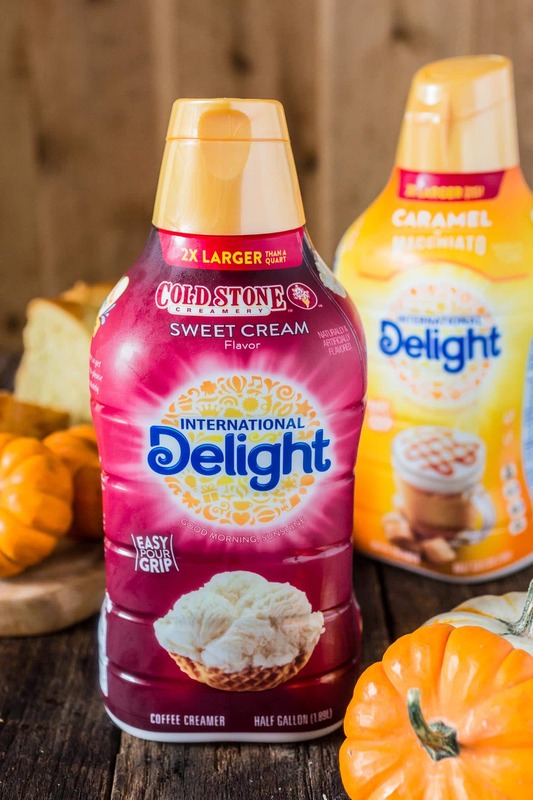 Well, we might be out of milk, but we are never out of International Delight®, as I cannot have coffee without it. And, thankfully, I had just bought a few of their new Half Gallon Creamer, so I had more than enough for the pumpkin french toast AND my daily cup of coffee. I am a bit obsessed with the half gallon. Not only I am never out of creamer, but the bottle is easier to hold and pour, compared to the conventional carton packaging. Besides, as long as I’m in your life – as your favorite ever food blogger (right?!? ?) 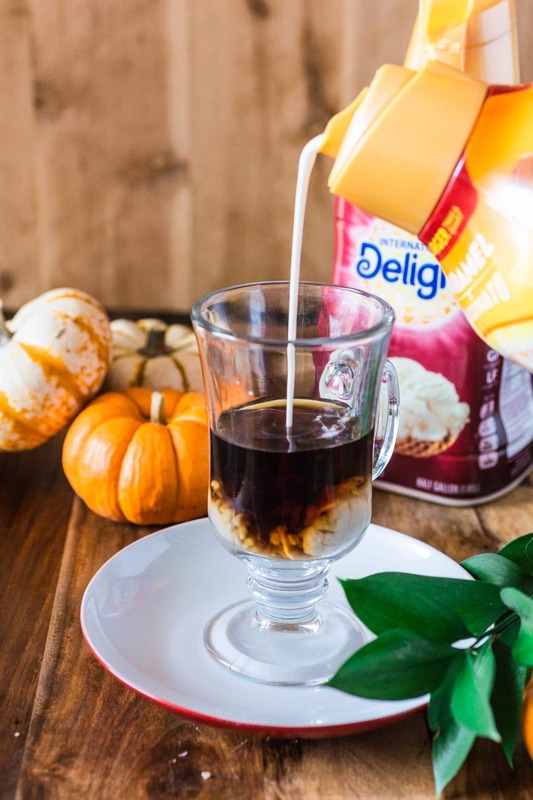 – you will never have to wonder what to do with leftover creamer. Because I am always coming up with delicious ways to use it up, like in this amazing Pumpkin French Toast. Choose the right bread! You need thick bread, like brioche of challah. The ideal thickness for a slice of French toast is 1″ thick. If the bread is too thin, it will be soggy and it can fall apart during cooking. Also, dry bread is best! You can either use semi-stale bread or, if you want to preserve the bread’s flavor, just pop fresh bread in a 300F degree oven for about 8 minutes per side or until dry. Mix it well. You will want to whisk everything real good, so you don’t end up with some scrambled eggs on your french toast. Soak, baby, soak! Good French toast has a soft, custard-y center. I let it soak for at least 5 seconds per side, more if the bread is too dry. 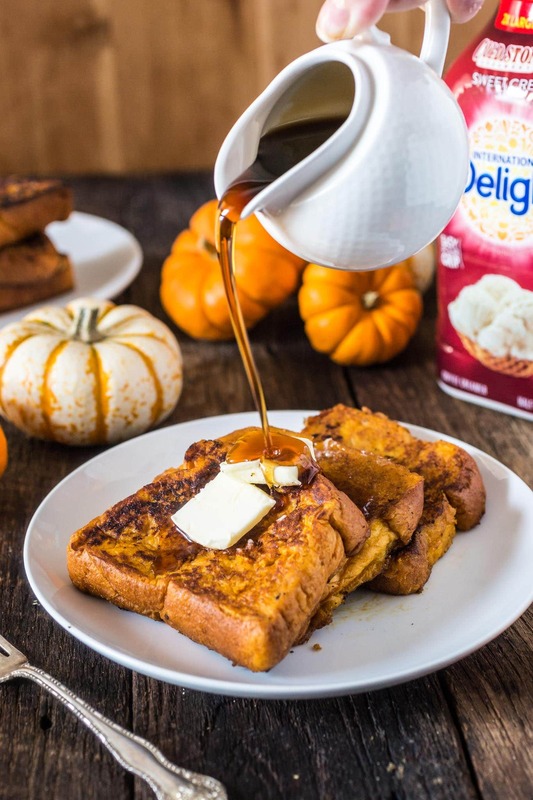 Be careful not to over-do it, or your Pumpkin French Toast will get extra soggy. Use the right amount of heat. First of all, always preheat the pan. We are after that sear that only a hot pan can provide. But that being said, you do not want to cook your French toast over high heat, as it won’t cook entirely and it will burn quickly. Medium heat is the way to go, and you should cook 3 to 4 minutes per side. 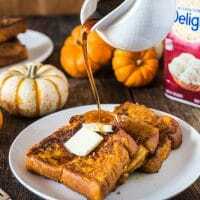 I’ve made this recipe quite a few times now and, at first, was really frustrated because I thought my Pumpkin French Toast was too soggy. It turns out that because it is so indulgent and creamy, it is softer than French toast made with milk, and that’s totally okay with me because it means better flavor and an amazing custard-y center! You can either serve it with butter and Maple syrup, like I did, or just sprinkle some powdered sugar. Wanna go the extra mile and add some whipped cream? I say: “Why not?” ? In a large bowl, whisk the eggs until fluffy. Add the cream, pumpkin puree, brown sugar, vanilla extract, cinnamon, pumpkin spice and salt and whisk well, until smooth. Reserve. Preheat a griddle or non-stick skillet over medium heat. Dip the bread slices, one at a time, into the pumpkin mixture for about 5 seconds per side, flipping over once. Repeat with all slices. Butter the griddle or skillet and, once hot, cook the bread for about 3 to 4 minutes per side, or until they get nice and toasty on the outside and cooked inside. You can add more butter as needed and should wipe the griddle/skillet with a paper towel if you notice some burning residue. Serve immediately, with your favorite toppings. These look super tasty. Browned bits and edges, syrup all over and the cream is a great idea. I could go for this now, forget the weekend wait!